Quite a while ago I bought this 3D printed tower on EBay for Star Wars: Legion and it sat on my workbench staring at me ever since as I wasn't sure what to do with it. It's quite basic design with a lot of flat surfaces, and the printing wasn't the best quality. So I had to have several sessions of sandpapering the printing lines smooth. After attacking it with plenty of sandpaper it was done and I started the pretty simple job of painting it. I also had to make a small platform for the interior, which I made from a circle of plasticard with textured plasticard glued on top and painted and weathered. I also added some copper wire to make hand rails around the upper platform. as you can see, two figures can comfortably stand on the upper level. Whilst in a terrain making mode, I quickly made a crashed speederbike piece from a spare bike that I had bought online and had turned up with most of the pieces missing. Rather than having the faff of sending it back, I thought I'd use it for something else. 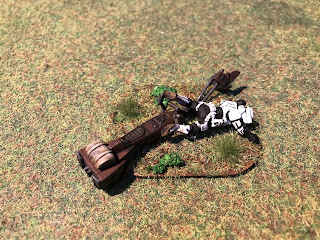 After making the missing parts out of plasticard, I converted the rider as though he has tumbled off, bent the steering vanes and drilled a couple of blaster holes in the body. 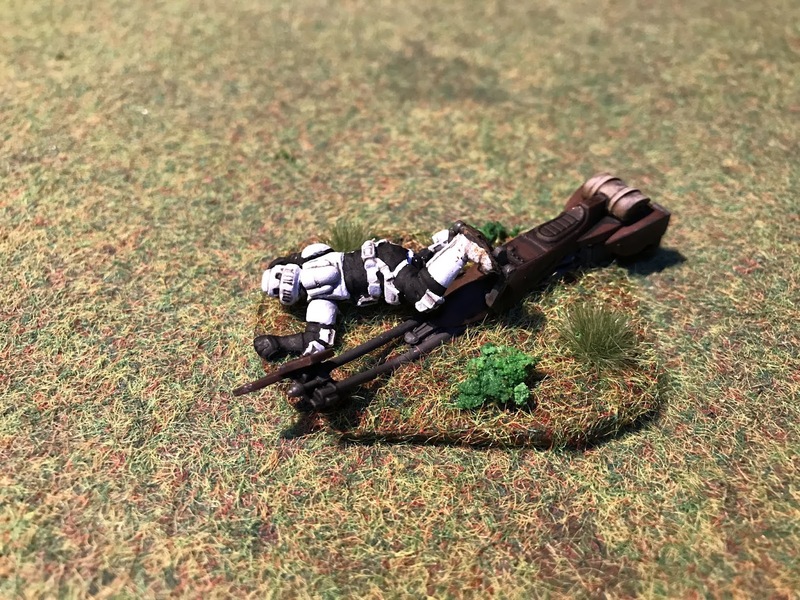 It's a pretty simple objective/casualty marker. So, there's a little bit more scenery added to my Legion collection, hopefully they will look good in games! Some great looking terrain there! The modifications to the tower make it much more usable. Thank you, it's a pretty basic print job, but it turned out OK. 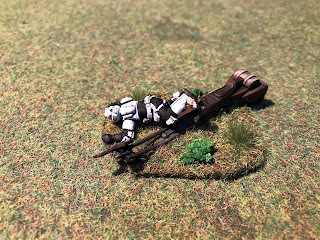 Unusual and fantastic looking terrain, impressive job! Thanks Phil, it did clean up OK!